On Peter Street in Manchester sits the abandoned Albert Hall and Aston Institute, built in 1910 by W J Morley. Albert Hall was once home to the Manchester and Salford Wesleyan Mission, though today it stands eerily empty awaiting renovation. In more recent times the ground floor had been occupied as Brannigan’s Bar–did the patrons know that just one floor up sits an organ big enough for a dozen people to climb inside? The building is vast, spread over four huge floors with the basement originally set aside for social work (including separate club rooms for girls and boys, a reading room, Sisters’ Office, kitchens and a scullery). The Ground Floor was the Lecture Hall with adjoining library and classrooms but today it is the now empty Brannigan’s lounge occupies this floor. Above, on the first floor is the where the real grandeur can be found. The main hall, with a capacity of 2,000, is lined with wooden seating in a horseshoe shape. With an epic vault, stained glass windows and ornate ceiling, it is nothing short of grand. Rooms to the rear of the hall include a few office spaces and one tiny area – a tucked away space that was possibly a projection room, lined with heavy metal panels which slide to reveal letter-box sized peep holes. It’s quite sinister back there, with the intention of the holes not really clear–none are seemingly large enough for a projection. A pitch black room adjoins it in which there are a dozen chairs arranged in a circle facing inwards like a séance. Still, that’s probably not as dramatic as it sounds given that the venue has been used as a filming location for shows like Most Haunted; the scribbled childlike crucifix left on a pad of paper resting on a chair isn’t as foreboding once you imagine it was at the hands of TV crew. The century old organ in the hall was maintained (and possibly built) by Rushworth & Dreaper. To give you a sense of the immense scale of the organ, a door below the pipes leads to a ladder upwards and during our visit, three of us scaled the organ together . There was room for more of us as we balanced ourselves inside the mechanics and peeked out into the main hall that’s been out of use for 60 years. There’s evidence of the former residents everywhere throughout the building. A dusty wig for instance, is less haunting when you realize that it’s the legacy of a dress competition rather than a century-old personal item of the Reverend Collier. There’s another floor to explore above the hall, and many of the rooms along the way are stuffed with Christmas decorations, bunny ears, and promotional posters for beer and football screenings. As you ascend the staircase to the top of the building there’s an old coat sign still etched on to crumbling paintwork. The building was inspired by Santa Maria della Spina in Pisa, Italy, though it’s by no means evident on the face of things. The exterior is of polished granite and brown Bermantofts terracotta tiles, similar to that on the facade of London Road Fire Station. 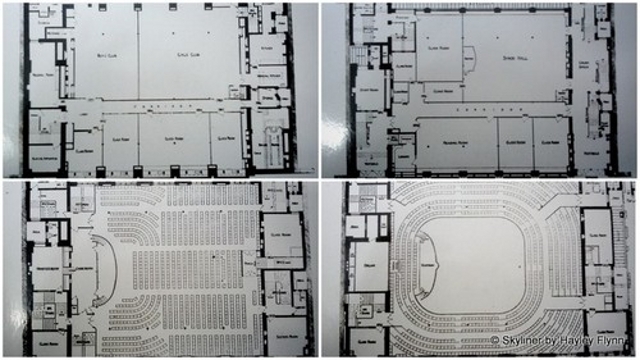 There seem to be six main staircases in all, all grand and vast in size. Still, the building, in the decay and dim light is maze-like. There are ten places of amusement, nine of which are theatres and music-halls, seating nearly 25,000 people, and bringing great crowds – perhaps the largest in the city. There are 22 licensed places in the immediate vicinity. In no crowd in Manchester is there to be found more men, women and young people to whom an appeal ought to be made in the name of Christ. Twenty-five years later the hall was going strong and the number of licensed premises had dropped, the church was confident that this trend would continue, with no inkling that in fact it would do quite the opposite. The temperance centres and even the hall itself would become nightclubs and bars. Interestingly, the church adapted the architecture of the halls to attract attendees. Knowing that their entertainment facilities would be key to their success, the missions made sure their premises didn’t resemble churches, but instead mirrored their competitors in design. The hall was closed in July 1969, 9 years after the sudden death of Reverend Collier. Albert Hall on Peter Street is due to reopen in 2013, as a restaurant and bar, as part of the ever growing Trof empire. If Reverend Collier doesn’t haunt the building, perhaps this guy does. Andrew Brooks is a photographer, a digital artist and a film maker living in Manchester; his previous works include the Secret Cities exhibitions with Curated Place. Please visit his site to see these images and more in high resolution and in all their glory – exactly as they should be viewed. This article originally appeared on The Skyliner. Get in touch with the author @skylinermcr. Photos by Andrew Brooks. I took part in a concert in this hall in about 1970 (much less than the 60 years mentioned). it was a mass brass band centered around Chain Bar Methodist Silver Band along with the Cestrian Male Voice Choir. The concert was arranged by George Artingstall, a Methodist Minister from Cheetham Hill. As I remember, the hall closed because Greater Manchester Police wanted the land to build a new headquarters on the site (very close to the existing HQ) . However this plan was later abandoned and they moved into Chester House. At that time, the area taken over by Brannigans was a Rover car showroom. I have always wanted to see this hall restored as a concert venue and was heartened when I walked passed recently and saw work being carried out. I stopped and chatted to the builders but as work was in progress I couldn’t go in. This is a wonderful article. Now we know how many holes it takes to fill the Albert Hall.